While the Americas region still accounts for one in five of the world’s eggs, the annual rate of increase there has slowed to less than one per cent, according to Terry Evans in his new series examining the trends on egg production across the globe. More than 40 per cent of the region’s eggs are produced in the US but continued rapid expansion in output is forecast for Argentina, Brazil, Colombia and Peru. 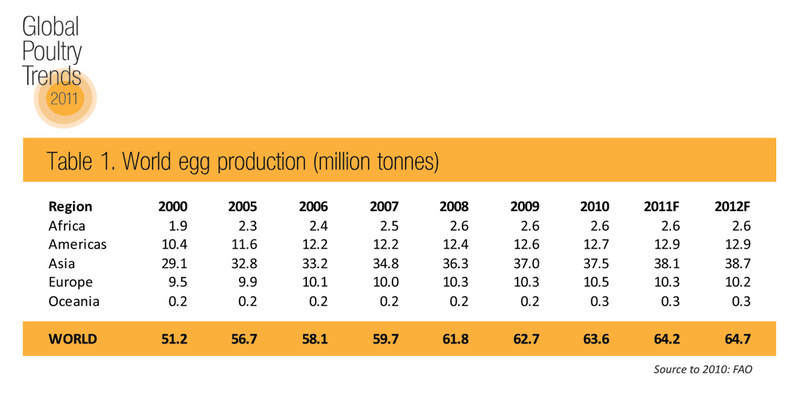 Between 2000 and 2012, world egg production will have expanded by a little below two per cent a year from 51.2 million tonnes to almost 65 million tonnes (table 1). As a region, the Americas has exhibited a similar growth rate as output there has climbed from 10.4 million tonnes to an estimated near 13 million tonnes. However, latterly, the annual increase in this region has fallen short of one per cent, primarily because growth in the US, the region’s largest producer accounting for some 43 per cent of total output, is forecast to increase production this year and next by less than one per cent. In 2010, the most recent year for which production data is available for every country, the Americas accounted for almost 12.7 million tonnes out of the global total of some 63.6 million tonnes (table 2). However, since 2000, the Americas’ share of world production has slipped somewhat, from just above to a little below 20 per cent. According to FAO data, the number of layers in the region in 2010 amounted to almost 1050 million out of a global total of some 6,500 million. The region’s capacity to process eggs appears to be a little under 20 per cent of all eggs produced. However, this figure masks a massive difference between the US and Canada, where the egg processors have the potential to utilise the best part of 30 per cent of table egg production and those countries in the south of the region where the processing capacity ranges from around nine per cent to three per cent or less, with an overall average of below seven per cent. The ranking of the region’s countries by output (table 3) reveals that the largest seven accounted for almost 11.5 million tonnes or more than 90 per cent of the total in 2010. In table 4 and figure 1 showing the performance of the leading producers since 2000, we have projected the data for 2011 and 2012. While we have concentrated on the leaders, it is worth pointing out that some of the smaller nations have recorded substantial expansions. Panama, for example, more than doubled output between 2000 and 2010, while Paraguay and the Dominican Republic increased production by 80 per cent or more. In Cuba and Uruguay, the industry expansion exceeded 40 per cent and Chile recorded a 33 per cent rise. It should be noted that more often than not, the production data in these tables is for all hen eggs including hatching eggs for both the layer and broiler flocks. Globally, it is considered that hatching eggs represent around five per cent of the total though, on an individual country basis, the proportion accounted for by hatching eggs varies greatly depending on the size of the broiler flock in relation to the production of table eggs, and in some instances, the quantity of eggs produced for exporting either as hatching eggs or day-old chicks. The importance of the broiler sector in this calculation is well exemplified by the USA and Brazil where hatching eggs represent a large proportion (12 to 13 per cent) of total hen egg production. Egg production in the US in 2010 at 7,622 million dozen, showed a one per cent increase on the 2009 figure of 7,546 million dozen. Hatching eggs are estimated to account for some 982.7 million dozen or 13 per cent of this total. Estimates for both 2011 and 2012 point to gains of just 0.4 per cent, though for table eggs, the percentage gains are roughly double this, the totals estimated to rise to 6,603 and 6,645 million dozen, respectively. Table egg production in the US for 2010 is put at 6,550 million dozen, of which just over 57 per cent will have been sold via retailers, almost 32 per cent to breakers for foodservice, manufacturing, retail and export, some eight per cent to institutional outlets and a little over three per cent exported in shell. The commercial flock (93 per cent lay white eggs) averages around 280 million, with over half of the birds found in the five largest egg producing states – Iowa (52 million), Ohio (27.5 million) Pennsylvania (24 million), Indiana (22 million) and California (19.5 million). There are some 64 companies in America with more than one million layers, of which 14 have over five million. Some 80 per cent of the country’s flock is owned by members of an egg co-operative, United Egg producers (UEP). In 2011, UEP and the Humane Society of the United States (HSUS) agreed to work together towards the enactment of comprehensive new Federal legislation for all US layers. The proposed legislation would require that conventional cages, currently used by more than 95 per cent of the industry, be replaced over an ample phase-out period, by the new enriched colony cage systems. This change could cost the egg industry an additional $4 billion over the next decade and a half. Converting egg numbers to weight depends on what is considered to be the average weight of an egg. For table eggs in the US, this is considered to be 60g. So, taking a slightly lower figure to allow for hatching eggs, by 2012 total egg output in the US will be in the region of 5.5 million tonnes. However, one long-term projection to 2020 does not see this figure rising above 5.7 million tonnes. Indeed, even this may be optimistic depending on the impact of the change from conventional batteries to enriched colony cages has on the industry. This switch in production systems will increase production costs that may not be quickly recouped from the market, applying a brake to the rate of growth. There is also the possibility of increased imports from Mexico putting pressure on prices which would also act as a disincentive to US expansion. Another problem facing US producers is how the use of corn (maize) for ethanol will impact on feed costs. In 2011-12, it is estimated that ethanol production will utilise 37 per cent of the crop compared with 35 per cent for animal feed. Nevertheless, some easing is anticipated in grain values and hence feed prices in the year ahead. Mexico is the second largest producer in the region its industry’s output having expanded by 600,000 tonnes or 33 per cent since 2000, although according to FAO figures, latterly annual growth has been contained to less than one per cent. However, another source points to a more rapid expansion. Whatever, output is likely to be in excess of 2.5 million tonnes in 2012. Some 95 per cent of the birds are brown–eggers and all are housed in conventional cages. The likely ban on this system of production in the US in the foreseeable future has led to the view that some American egg operations may set up units in Mexico specifically for the US market. Brazil’s egg industry expanded by 29 per cent during the first decade of this century as output reached 1.95 million tonnes in 2010. Output should top two million tonnes in 2011 but here, as in the US, a significant proportion (possibly 14 per cent) will be hatching eggs. All the commercial sector is housed in cages and some three-quarters of production is white-shelled. The quantity of eggs broken out is estimated to be around five per cent although the processing capacity is considerably higher than this. Although Columbia’s industry appears to have suffered a setback in 2010 compared with the two previous years, output is still almost 60 per cent above the 2000 level and will soon come close to 600,000 tonnes a year. Egg production in Argentina grew by around 55 per cent over the years 2000 to 2010 as it climbed from 327,000 tonnes to more than 500,000 tonnes. The figures for this country provide a good example to highlight the difficulties in assessing egg production by weight. According to the data provided by the Argentinean authorities to the FAO, the number of layers in 2010 totalled 36.1 million. Egg output is put at almost 9,020 million, equivalent to an average of some 250 eggs per bird. However, the tonnage of eggs produced is calculated at just over 505,000 tonnes (table 2) and pointing to an average egg weight of 56g. Now, according to a report on Argentina’s laying industry published by the well respected International Egg Commission (IEC), the number of layers in 2010 totalled 38 million and the average egg weight was 63.5g, yielding an output of 660,563 tonnes, which points to an average yield of some 274 eggs per bird. The 2010 output figure was some 15 per cent up on 2009, reflecting a similar percentage increase in the number of layers. Whichever series is more correct, there can be no doubting that Argentina’s egg industry has experienced dramatic growth in the past decade or so. Only one per cent of production is considered to come from non-cage systems, while the split between brown– and white–shelled eggs is said to be 45:55. Industry growth in Canada since 2000 has averaged just 1.4 per cent a year, with total hen egg production in 2010 of some 429,000 tonnes comparing with around 400,000 tonnes back in 2005/06. The quantity broken out continues to rise and currently represents about 23 per cent of table egg production. Peru, the seventh largest producer (table 3) increased output by more than 75 per cent between 2000 and 2010, with an average annual growth approaching six per cent. Some 96 per cent of layers are in cages with a similar proportion producing white–shelled eggs.